Chicago is a wonderful city to visit at any time of the year and the city does not really have an 'off-season' and is busy throughout the year. Even in the coldest winter, people flock to Chicago to enjoy the Christmas festivities and decorations. The quietest time in Chicago is from January to mid-March and this is probably the only time when hotels reduce their prices to attract more tourists to the city. The main tourism and tourist information office is the Chicago Office of Tourism, which is located in the Cultural Center, 78 East Washington Street, Chicago, 60602, Illinois, USA (tel: +1 312 744 2947). Tipping is more or less compulsory, with waiters in restaurants and taxi drivers usually being given a 10 or 20 % gratuity or thereabouts. Hotel staff, such as luggage handlers and porters happily accept a tip of one or two US dollars. Generally, no other public service workers expect tips. As in any large city, always maintain an awareness of your surroundings and try to blend in and not look like a tourist. Look like you know where you are going and avoid street entertainers who are often clever confidence tricksters, and these are often places where you are most likely to have your pocket picked. Thieves are very skilled, so be particularly careful with hand baggage. Wear a bag or camera across your body, or even use a concealed money belt. Sensible rules apply, do not flash large amounts of cash, hide jewelry or leave it at a safe in your hotel and avoid the less populated subway lines late at night. Chicago has actually never been safer and crime levels are down. English is the most commonly spoken language in America, but locals in Chicago's have developed there own version, an 'American English'. This consists of many variations of words, such as 'sidewalk' for pavement and most natives in Chicago tend to speak very fast. This cosmopolitan city is home to a large number of different cultures and most religions have a presence. Newspapers generally list times of services for the main denominations. 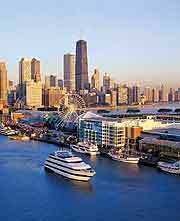 Chicago contains numerous cathedrals, chapels, mosques, temples and synagogues. Most pharmacies are open from at least 09:00 until 18:00. Drugstores will usually open until 21:00 and these do have a pharmacy counter for dispensing prescriptions. Drugstores are like mini-supermarkets, with a wide range of products on sale.